From the stars we came, and to the stars we return, from now until the end of time. We’ve mentioned here and there in our podcasts about some of the actors on “Babylon 5” who died much too young. Now, for the first time since starting the Audio Guide to Babylon 5, we have to deal with the loss of yet another member of the B5 family. At the time of posting, actor Jerry Doyle – known best by this little podcast circle as Security Chief Michael Garibaldi – has died. That’s about all that is known at the moment, with no details as to how. After “Babylon 5” wrapped, Doyle moved on to try his hand at politics and then became a popular radio host for conservative views, eventually creating the Epic Times website. Doyle would use this platform to support his former castmates, such as promoting Claudia Christian’s efforts in helping people break alcohol addiction. In the statement linked above, J. Michael Straczynski pointed out how he disagreed with Doyle on almost every issue when it came to politics, but valued him both as a friend and as a consummate professional during his acting career. RIP, Mr. Doyle. Thank you for sharing your talent with us. Not sure if there’s a more appropriate place for this to go, but having just heard of the passing of Jerry Doyle… dammit, this one hurts. It was hard not to root for Garibaldi throughout the entire run of B5, and hard not to instantly nominate him as “favorite character” for his sense of humor and sense of justice alone. I was never really au fait with Mr. Doyle’s personal politics once he got into the talk radio sphere (but then, I say that about many on both sides of the aisle), but at least he approached that job with more wisecracks than fire and brimstone. I’d tune in once in a blue moon just because, in so many ways, Garibaldi was him and he was Garibaldi. His recent photo that keeps getting retweeted looks a lot like my late dad, whose own addiction problems were still affecting my life at roughly the same time as B5’s early seasons. It never occurred to me until now that, on some subconscious level, I loved the character because he pulled out of the nose dive and got back on course in a way that I wished someone else could have. And in the meantime, his self-destruction was painfully real to watch. This year is kind of awful. Extreme measures may have to be taken to prevent it from killing again. Sorry for the deviation from topic. I’m adding to Earl green comment it’s sad day today I loved Jerry portrayal of Mr Garboldi I always had a smile when he was on. I saw on YouTube Babylon 5 events w/the actors and they said that JMS when he wrote his characters he fitted them to the actors Bruce said that one time the cast has argument about death penalty and Jerry said something about killing them all and few weeks later Mr Garboldi said it, Michael Garboldi was Jerry Doyle. The sad news has already been mentioned in the spoiler thread, but I thought that someone should post it here for the new people. Jerry Doyle, who played Michael Garibaldi, has passed away. Mr. Doyle had an interesting career: from accountant to actor, from actor to conservative radio host. One obituary is here: http://io9.gizmodo.com/rip-jerry-doyle-babylon-5s-mr-garibaldi-1784462252 . Since my earlier post was intended as an announcement, and not as a personal comment, I’ll add something about Mr. Doyle and what he brought to the show. I don’t remember ever having seen Jerry Doyle act in anything else, before or since. That surprises me, because he seemed tailor-made to be one of those recurring character actors that one sees over and over again in different shows and films. It’s easy to imagine him as (several different) perpetrators of the week on Law and Order. He must have been a remarkably gifted natural talent. Mr. Doyle had much less acting experience than you would expect – less than three years – when he became one of the main cast on Babylon 5, although some of his experience was in the meat grinder of daytime soap opera. His performances on Babylon 5 aren’t flashy and overtly “powerful” in the way of a Katsulas, a Furlan, or a Jurasik, But Mr. Doyle played an extensive range of emotions and attitudes over his five years, and all of them seem effortlessly convincing precisely because they don’t seem (seem!) like acting. 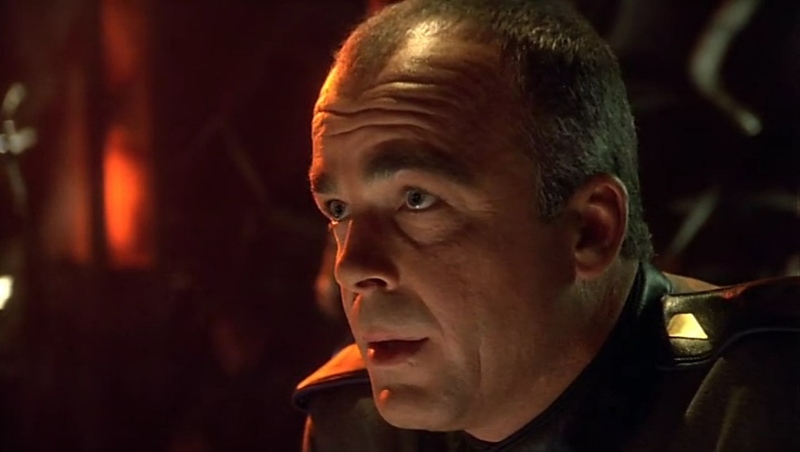 For me personally, the image of Jerry Doyle’s face is fixed in my memory of the single moment that means most to me from Babylon 5. I won’t talk about it here, because it has yet to appear on the show. But I’ll try to remember to make note of it when it arrives. Somewhat off-topic, but I just have to share my love for the show. Moonlighting was the TV show that made Bruce Willis a star. I watched it in the 1980s when I was just a kid, and still liked it a lot in my thirties, because I love its very meta humour, breaking the fourth wall, machine-gun dialogue and impeccable comic timing of Bruce Willis. Too bad the quality started to suffer after the third season when the show that relied on the chemistry of its main stars was missing one or both of the stars in many episodes, Bruce Willis was starting his action film career with Die Hard and Cybill Shepherd was having twins. “He is an annoying man, but I would miss him”, as Londo said. In season one, in my formative fandom during the first seasons initial airing, Garibaldi was my favourite character, in a large part due to Doyle’s portrayal. I loved his down to earth Everyman-ness in the wild and often wacky world of season one. By season 4 his descent into oblivion was one if his best acting work. I’ve never seen Doyle in anything else but damn it he stole my fandom in B5. Goodbye Jerry. I’ll treasure the performances. Say hello to those beyond the rim for us. RIP. As Garibaldi, he brought (with conviction) that everyman hero, the Peter Parker factor, the decent bloke trying to do his job. From the off, his chemistry with Michael O’Hare and Peter Jurasik was superb, he knew how to carry the wise-cracks. His peekaboo delivery is one of my favourite scenes. He made our Garibaldi an icon, and had real range. I was distraught when I heard the news, unusual for me, because I have a buffer when it comes to people I’ve never met. I’m going to choose to accept that in a way, he’s still with us, and that’s what I hold to, not least because Doyle was so fricking good. New video tribute from John Hudgens.